Syria was supposed to give up 100% of its chemical weapons stockpile by February 5. But as of this week, Bashar al-Assad’s government has shipped out only 11%, and President Obama admits diplomacy is failing. 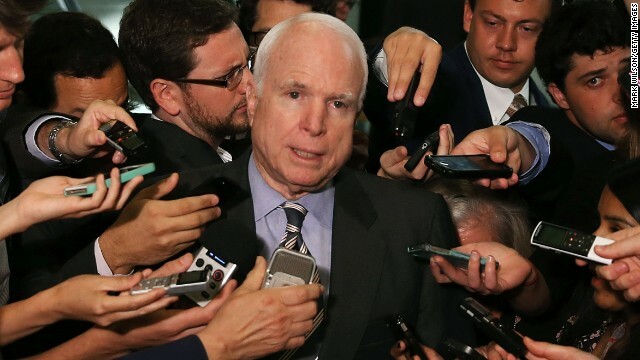 Senator John McCain joins us to talk Syria, Iran, and wee bit of politics. Class warfare heats up another notch as a high profile CEO suggests only taxpayers should have the right to vote. Minimum wage and populist politics with businessman Steve Forbes and Austan Goolsbee, former Chairman of the Council of Economic Advisers. Speaker Boehner’s next move, Senate Republicans versus Ted Cruz, and what we learned about Hillary Clinton from her best friend’s diary. Don’t miss our panel with CNN Political Commentator Kevin Madden, The Root’s Corey Dade, and democratic pollster Margie Omero.